Any excess in power beyond that required to overcome drag will cause the vehicle increase kinetic or potential energy. We consider this case by resolving forces about the direction of flight, Figure 13.6, and equating these with accelerations. 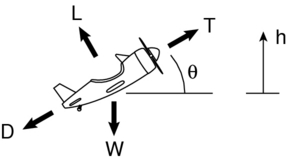 Figure 13.6: Force balance for an aircraft in climbing flight. where , for example, and . The power available is a function of the propulsion system, the flight velocity, altitude, etc. Typically it takes a form such as that shown in Figure 13.7. 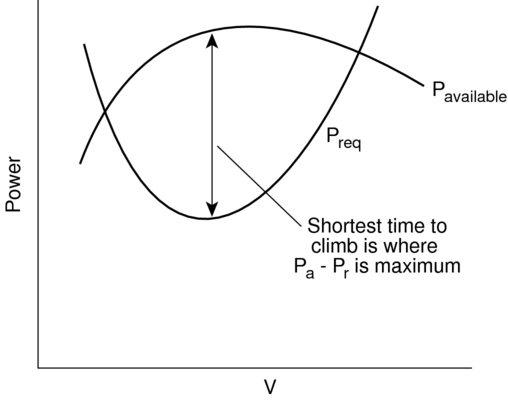 The shortest time-to-climb occurs at the flight velocity where is a maximum. 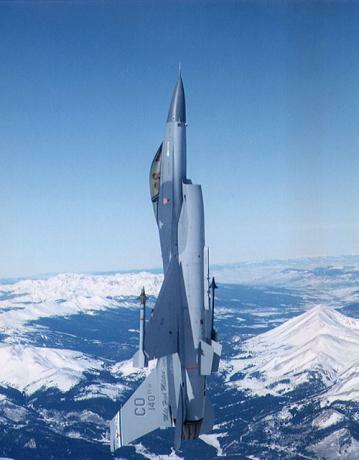 We conclude this section with a dramatic photograph of an F-16 in a vertical, accelerated climb, Figure 13.8. Figure 13.7: Typical behavior of power available as a function of flight velocity. Figure 13.8: Lockheed Martin F-16 performing a vertical accelerated climb.